Dr. No (1962) Antechamber. Production Design by Ken Adam. Adam established the larger-than-life scale of the 007 adventures in his first Bond film. Like McGoohan’s "Prisoner" discovering that he has gone through the looking glass when he first meets Number Two, Professor Dent travels to a remote complex to confer with his master, Dr. No. The predictable world of blue sky and ocean is left behind for the irrational and ominous atmosphere of cinema's debut Bond villain. 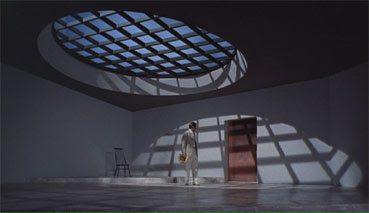 The antechamber, like Adam’s other designs, has an "ahead-of-contemporary" look, with a hint of The Cabinet of Doctor Caligari in the spider web shadows cast by the domed, slanted skylight. It's an unforgettable scene; Dent walks in, dwarfed by the space- empty but for a tiny chair. Dr. No’s chilling command breaks the silence, “Sit down.” Movie-goers, like Dent, knew immediately that Bond was a new brand of larger-than-life adventure. STAY TUNED FOR SET #7 -AND- THE TOP 5 SETS FROM SPY AND MOVIE WRITERS AROUND THE GLOBE!